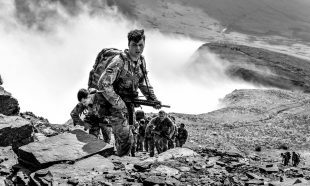 The Mail on Sunday today carries a number of reports on the British Army, suggesting concerns over political correctness have led to a lowering of standards on infantry fitness tests. It leads on a case from last week in which a number of people who failed the physical entry test for the platoon sergeants battle course were then sent back to their units, demonstrating that there has been no change in policy or the very high standards set by the infantry. All those who fail are welcome to try again in future. Infantry courses are some of the most demanding in the Army and not everyone is ready to undertake them at their first attempt. Those not making the start standard will receive feedback on their performance and have the opportunity to attempt the course again later in their career. We wish them all the best of luck. A comment piece in The Sunday Times Magazine praises the Army's new recruitment campaign, Your Army 19, for its use of labels such as “Me Me Me Millennials”, “Snowflakes”, “Selfie Addicts” and “Binge Gamers” in attempt to appeal to a new generation of recruits. Columnist India Knight suggests that "Snowflakes" generation have unique qualities to offer as they are "kind, thoughtful, self aware" and try to "treat other people with respect". The Army sees people differently and we are proud to look beyond the stereotypes and spot the potential in young people, from compassion to self-belief. We understand the drive they have to succeed and recognise their need for a bigger sense of purpose in a job where they can do something meaningful. The Observer reports that military planners have been deployed to other Government departments as officials make contingency plans for a potential no deal Brexit. The piece is based on a Freedom of Information release which showed that 14 military planners have been posted to four different Government departments - the Home Office, the Cabinet Office, the Department for Transport and the Foreign and Commonwealth Office. Defence has offered to support and assist with planning and coordination in preparation for leaving the EU and the requests for military planners demonstrate the unique skills and operational planning expertise the military can offer. Planners will be involved in a variety of tasks tailored to the need of the requesting departments. The MOD routinely works with other Government departments on planning for a range of contingency scenarios. Pictured are Staff and Students from the Infantry Battle School during The Section Commanders Battle Course, Exercise Fan Dance in Brecon.